This is being widely reported right now. So sorry to hear this. Great comedian, wonderful actor. The Oscar-winning actor and comedian was 63. Oscar-winning actor and comedian Robin Williams has died at age 63, according to police in Marin County, Calif. The full statement is below. An investigation into the cause, manner, and circumstances of the death is currently underway by the Investigations and Coroner Division s of the Sheriff’s Office. Preliminary information developed during the investigation indicates Mr. Williams was last seen alive at his residence, where he resides with his wife, at approximately 10:00 pm on August 10, 2014. Mr. Williams was located this morning shortly before the 9-1-1 call was placed to Marin County Communications. At this time, the Sheriff’s Office Coroner Division suspects the death to be a suicide due to asphyxia, but a comprehensive investigation must be completed before a final determination is made. A forensic examination is currently scheduled for August 12, 2014 with subsequent toxicology testing to be conducted. Williams, a four-time Oscar nominee, won a supporting actor Oscar for Good Will Hunting. He most recently starred in CBS' comedy The Crazy Ones, which lasted only one season. He recently checked into rehab in an effort to maintain his sobriety. Oh this is so sad....terrible news. Perhaps the cancellation of his television show was an issue? I don't know really but that might have been one of the factors in his depression. A person who brought so much laughter to others was not able to find that lightness himself. That is truly sad. I didn't know this. Sad. I'll always remember him for the part he played in Good Will Hunting. I often wondered when watching him in some of his riffs if he were hypomanic, and just happened to be an extremely funny guy. I liked his performance in Good Will Hunting. Sad... I read somewhere that depression could really make you want to destroy yourself. Terribly angry with the media. The story broke about 7PM last evening on national tv. The statement from his wife was read- please remember him for his work and ability to make people laugh, not the way he died. So- from that moment on, up until midnight when I turned off the tv and then again for the early morning shows- the entire discussion ( with minimal exception to discuss his work) was about the depression. Dr Drew and a few other experts dissected the hell out of clinical diagnosis, treatment, etc. Then the moderator would read the wife's statement. So frustrating. This morning one program confirmed it was by hanging. So terribly terribly sad. Always get so cranky(there's another word) when people do this. Sometimes just by reaching out...and talking it out to anyone.....you can be helped!! NewFan unfortunately depression is just not a mental issue, it's often involves a chemcial imbalance in the body including an imbalance of hormones - which for Robin could have been there for years - hence the drug/alcohol abuse or it could have manifested itself more recently as he got older. For instance, cortisol which is the flight or fight hormone, when it gets out of balance, it surpresses all the other hormones, including serotonin. Serotonin is the hormone that not only helps us sleep better but also is considered the "happy hormone." It also regulates our feeling of well-being. If you have low Serotonin it's more likely that you'll be cranky as hell, potentially clinically depressed, possibly suicidal. Factor in any feelings of inferiority, of hopelessness, etc. and this could cause a person to really believe there is no way out or no light at the end of the tunnel. Doctors use drugs to try to help but often it doesn't work well or the long term side effects are not good. Some of the drugs used often make the depression worse. Robin may have been trying to feel better but once the cycle of imbalance in the body starts, it's difficult to get out of it. I feel for his family and his friends who are so devasted by his death. And I get frustrated also because there IS help out there but many doctors don't know about it and even if they did would often be too skeptical to try it with their patients. But I believe in time as more and more people are helped even the hardest drug pushing doctors might take a look at it. There is a new format around here when you visit your MD , seen in Emergency Dept or admitted to hospital. You are asked-professionally but in my opinion rather abruptly, if you are experiencing symptoms of depression in the past 2 weeks. Not sure why the 2 week limit, but it is part of the patient/dr work-up. Just in case the quote from Good Will Hunting turns up.. When Robin Williams won an Oscar for his portrayal of a psychiatrist in the movie Good Will Hunting, he told South Boston residents “You're a can of corn. You're the best.” In Southie (South Boston) that’s slang for good-natured and easygoing. 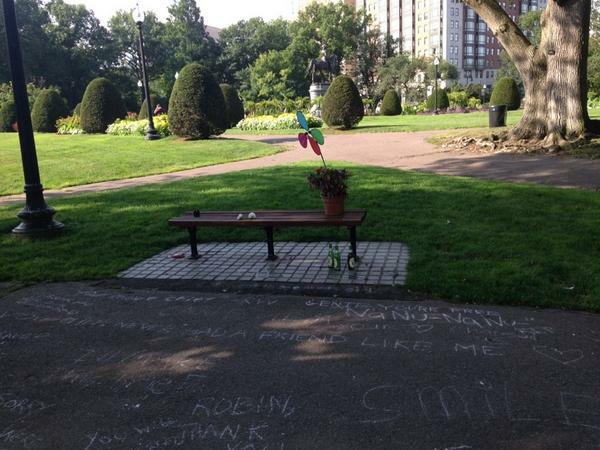 This is the park bench from the scene between Robin Williams and Matt Damon. Lots of visitors yesterday and today. Robbin William was/is one of my favorite actors, I used to watch Mork & Mindy everyday. Anxiety was his problem. He couldn't control his fears. So sad that someone who brought so much joy to so many couldn't experience it himself. He recently did stint in rehab. Apparently they missed the signals or something happened after he got home to cause him to despair. So very, very sad. Atalante wrote: Anxiety was his problem. He couldn't control his fears. He said it in an interview tiens. The story coming out here seems to be that he was depressed, at least in part, because his tv series failed and because he had serious money problems. He has always been open about his problems with alcoholism and depression, and fought them both for years. Sadly, he seems to have lost this last battle. May he rest in peace. He will be missed. It's just tragic how the same mind that holds such genius can be the source of so much pain. I've always had a theory that any one person can be only so brilliant before the mind crosses the line into pathology. It would be fascinating to know where that line is, and if it differs depending on the genius' special ability. many issues came up since his death. Mostly from CNN/Fox broadcasts, not E!, Access Hollywood, etc. 2. He had open heart surgery 2009. The type of surgery he had causes depression a majority of the time. Add that extra load to an already depressed individual, and you're heading for trouble. 3. Chronic depression, like chronic pain, puts you in a "bad place"--suicidal ideology,-. want it to end. Not a selfish thought, just the need to make it stop. 4. he had returned to Minn in July , possibly for help with his depression. We'll never know-that's confidential. side note.. yesterday's press conference with the Sheriff's office. Made a goof, initially said the letter would not be discussed, then back tracked to say will not discuss if there was a letter. deceased's memory when the media starts dissecting and analysing and gossiping about someone's death by suicide. It's so intrusive and insensitive and cruel and almost inhuman IMO. I just read an article that his wife stated that he had been diagnosed with Parkinson's Disease. melbert wrote: I just read an article that his wife stated that he had been diagnosed with Parkinson's Disease. Picachu - in link above the Coroner talks about why such information was released. I still think it was a bit of sensationalism on their part though. A former coroner made an interesting point. If a celebrity dies under suspicious circumstances and the information about the death isn't made public, it opens the family up to all kinds of speculation that can go on for years. In his opinion this can be even harder for them to deal with than getting the facts out right away and moving on. He made me think of Marilyn Monroe, and how there are still books and articles about how she really died. I can't imagine that having it constantly dredged up is easy for her family. Yes, they have to make the information available to the public, they do not have to set a press conference and give out the details themselves on live tv. I think that was tasteless and cruel. I wish his wife wouldn't issue statements giving his private health information -- especially after asking for privacy to grieve. Regarding Marilyn, unfortunately I don't think that there was any close family of hers to try to stop all the speculation over the years, so plenty of opportunities for the journos to make their money at her expense. Joanna - I was just using Marilyn as an example of his opinion. I know California law requires someone's cause of death to be part of the public record. I don't know why they did it in a press conference. Maybe they were trying to avoid people thinking there was some sort of cover-up. I don't know. Maybe his wife was upset by all the baseless speculation that he'd killed himself over something as silly as a cancelled television show or that he'd been having money troubles. I don't know why people can't accept that chronic severe depression is awful enough for people to not want to be here anymore. There doesn't have to be a specific "why". Parkinson Disease would have shown up in the autopsy report. Maybe she thought it would be better if she made a statement. Have to wait for the toxicology report, can take up to several weeks. Her statement was much longer than that he had Parkinsons. I believe she wanted to dispel rumors that he was in serious financial trouble (apprarently untrue) or back on drugs (she claims this is not true). She does reference his long struggle with depression and anxiety and encourages others struggling with the same to get help and support. Clinical depression does not have to have a "why". The person can have a great life and still feel hopeless. There may be chemicals in the brain that contribute/cause depression--not necessarily an emotional response to a set of life circumstances. That is why I was so disgusted when I heard Kim Kardashian say her brother "needs to snap out of it"--it is not that easy and I hope they are getting him the help he needs and not treating it as something he can control. Fava you are spot on about depression. acting in a very cruel manner IMO. Obviously there's a great difference from being fed up with life to actually suffering from depression. The depressed person is often non verbal about their feelings. I wish there were actually a different name for clinical depression so that it's not confused wih the general depression that we all get when we feel down because we're going through a rough patch. The two are very different and calling both 'depression' just doesn't help. You're right Katie, a big part of the problem lies in people not understanding the difference between "feeling sad" and clinical depression. In one of the opinion pieces I read after Robin's death (wish I could remember which one and link to it, it was great), the author suggests we stop using the phrase "mental illness" entirely, as the word mental suggests it all in someone's mind. She suggested referring to such illnesses as brain diseases, so that people would equate them with physical disease. Then rather tham saying someone killed himself we would say he lost his battle with depression, in the same way we say someone lost her battle with cancer. The depression you are describing is called situational depression. Depending on the situation ( loss of a loved one, end of a relationship, loss of a job) it can be treated with medication and therapy, if necessary. The idea is the situation caused the depression ( which can last for days and up to yr or more) and once the situation is addressed or resolved (ie;re-employment) typically the depression is relieved. If treatment is involved, the therapist will look for symptoms that the situational depression may in fact be clinical, and therapy treatment will be adjusted. Does that make it any clearer, or have I really confused everyone. ?? Nope you have confused me PP, understand what you mean. Situational depression is more of a temporary state caused by any given situation, loved ones death, unemployment just as you suggested, however true depression or clinical depression is far more complicated. For many years I have battled 'the black dog', so I can honestly understand why people commit suicide. I have been there and believe me it is not just a daily battle it is also moment by moment at times. For me it is not ' I want to die', it is stopping the blackness that slowly creeps down on you the weight is unbearable. theminis wrote: Nope you have confused me PP, understand what you mean. Situational depression is more of a temporary state caused by any given situation, loved ones death, unemployment just as you suggested, however true depression or clinical depression is far more complicated. Exactly my point. Sorry I didn't write it clearly. I just found this on Wimp video website. I'm going to pop it into August Chat thread too. So no Misses Doubtfire II, ... ?